The needs of every city in the world are taking care of our planet, to find alternative fuels and optimize the traffic. 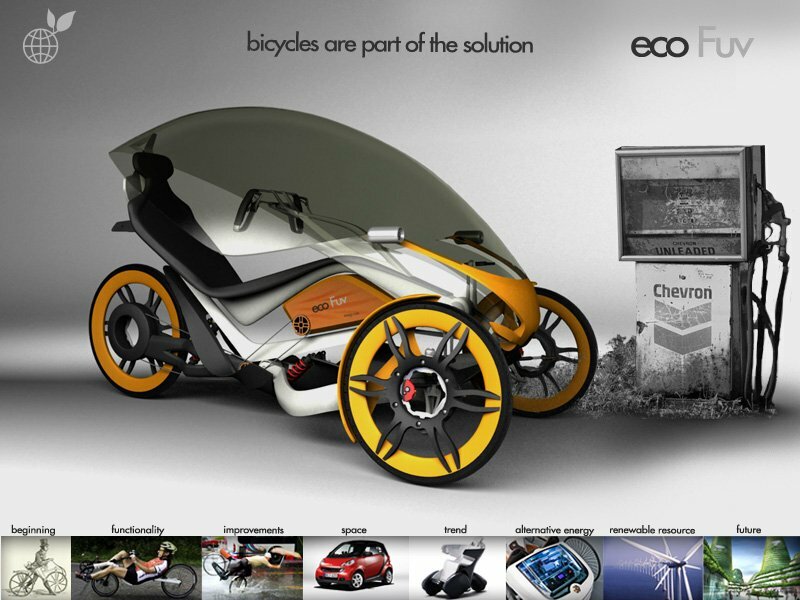 ECO FUV is a concept of urban vehicle-friendly environment, where the latter is a concept that is already implicit in a bike, what was done to strengthen its vehicle design as a city dweller. A bicycle as we know it needs to offer other benefits to becoming a complete and ideal urban vehicle. 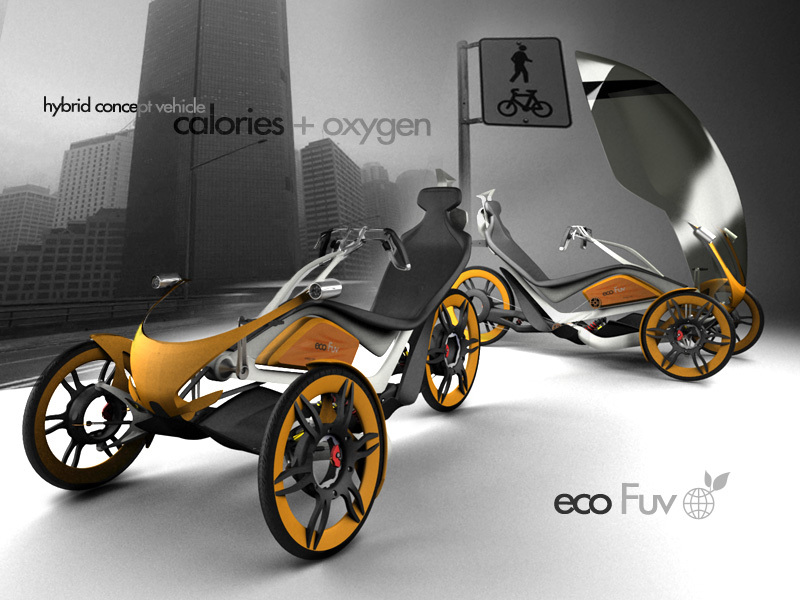 In the FUV project was intended to complete this idea, functional and technological additions to the bicycle a more viable alternatives to travel the city looking after the environment. 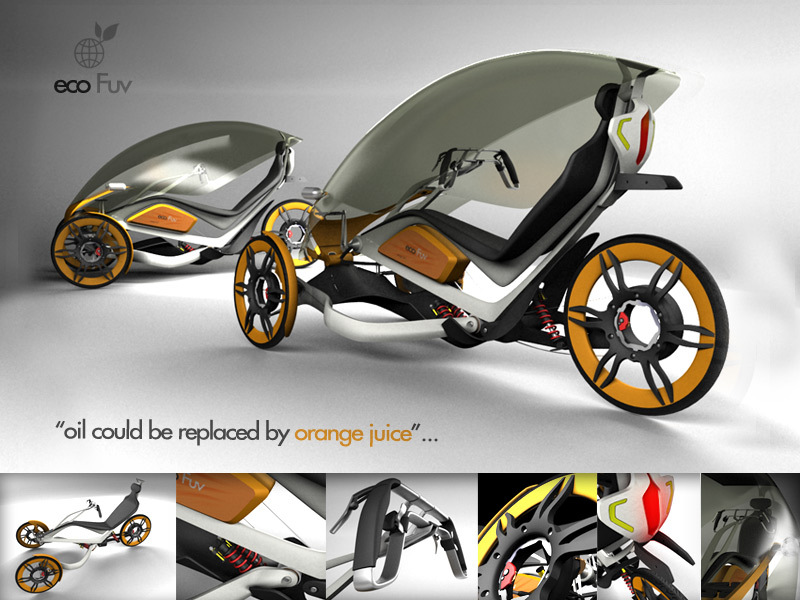 ECO FUV can be sheltered from bad weather and e integrated as any other vehicle that travels through the streets: signage and traffic lights, suspension, auto power supply (you can plug a cell phone behind the wheel to provide us with data while driving recharging), removable dome, static and dynamic stability, changing speeds to get around with minimal effort at any stage. The simplicity of the bicycle has strived hard and attachments can only be justified taking into account the qualitative leap in performance and intention to alternative to the car. Uses technologically advanced plastic materials to cooperate structurally with its slim and lightweight aluminum skeleton. New production techniques tan reduce production costs. Formally synthesizes “an insect in urban traffic”, with an image that seeks to produce a dual effect of strength and lightness according to where you view it. It could have customization options, colors and graphics of its parts. I am very interested in this product, and would like to know more about it… Has it gone into production, what speeds, and distance can it accomplish…? If not in production yet, are you near production, and what is it’s projected cost of sale price…? There are so many questions, and I’m sure I alone have not asked them all, so all that you can provide I would love to read… Thank you…….! I to am very interested in this beautiful recumbent trike, And would love to know more about as well…! Please if you can, could you provide more information on it production schedule, and when it will be available for sale to the public…. !